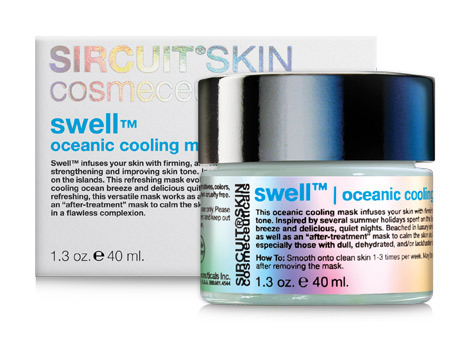 Swell™ oceanic cooling mask infuses your skin with firming, antioxidant and anti-aging benefits while also helping to support and improve skin tone. Inspired by several summer holidays spent on the islands, this refreshing mask evokes a sense of calm while you remember the cooling ocean breeze and delicious, quiet nights. Beached in luxury and delightfully refreshing, this versatile mask works as a daily cooling and anti-aging mask as well as an "after-treatment" mask with immediate skin tightening effects that promotes a glowing complexion. Infuses the skin with antioxidant and anti-aging benefits. Helps to improve skin tone. Provides an immediate skin tightening effect. Helps protect the skin from environmental stressors. Skin Type: Suitable for all skin types, especially those with dull, dehydrated, and/or lackluster skin types. How To: Smooth onto clean skin 1-3 times per week. May be left on up to 20 minutes. Remove with warm water. Skin will experience a cooling effect minutes after removing the mask. Shake well before use. Pepha®-Tight: An Algae extract that forms an invisible film that temporarily provides a skin-lifting effect which can improve the skin’s texture and appearance. Caviar Extract: This protein and vitamin-rich (especially Vitamins A, D, E and B complex) extract is best known for its moisturizing abilities. It improves skin hydration and works to decrease the trans-epidermal water loss, thus increasing the softness and smoothness of the skin. 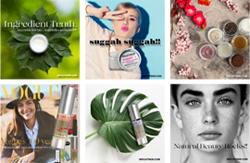 ​Formulated With: Aqua (Water), Glycerin*, Pullulan, Caviar Extract, Algae Extract, Hydrolyzed Collagen (Marine), Sea Salt, Pearl Powder, Aloe Barbadensis Leaf Juice Powder*, Lavandula Angustifolia (Lavender) Oil, Rhodiola Rosea Root Extract, Lonicera Japonica (Honeysuckle) Flower Extract, Citrus Aurantium Dulcis (Orange) Peel Oil*, Lonicera Caprifolium (Honeysuckle) Flower Extract, Hippophae Rhamnoides (Sea Buckthorn) Extract, Cananga Odorata (Ylang Ylang) Flower Oil, Jasminum Officinale (Jasmine) Oil, Santalum Austrocaledonicum (Sandalwood) Wood Oil, Phytic Acid, Phycocyanin, Sodium Hydroxide, Xanthan Gum, Carbomer, Menthyl Lactate (L). *USDA Certified Organic | NOP. Phthalate-free.